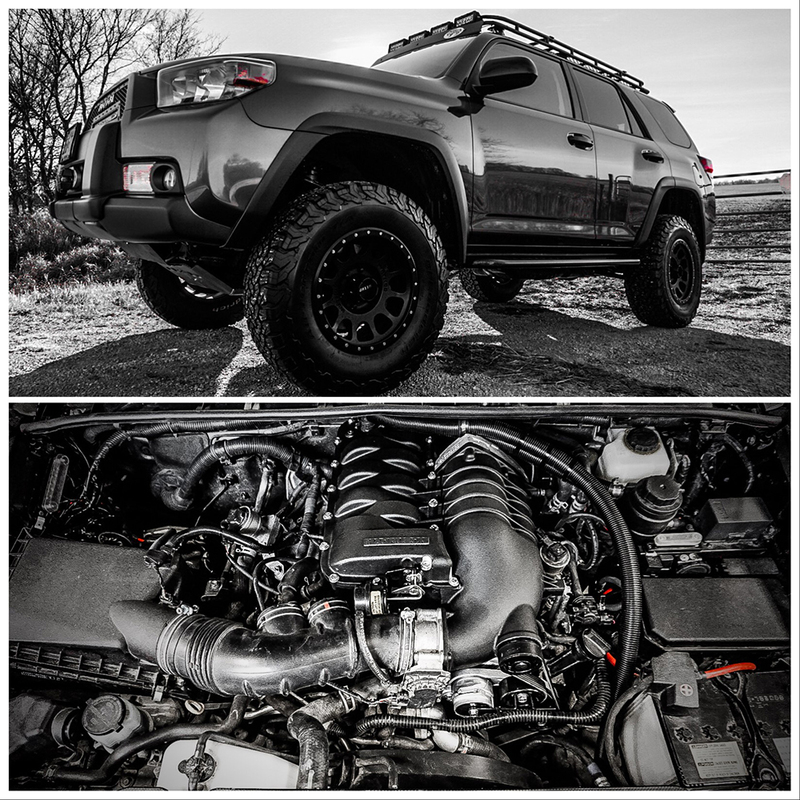 So after 8 years of the 5th Generation 4Runner community waiting, Magnuson Superchargers finally stepped up to the table and made a supercharger for the 2010+ 4Runner and FJ cruiser. This is a 1.3L TVS hybrid roots system which adds 30% more horsepower and 28% more torque to the vehicle, making a stock 4Runner 0-60 time go from roughly 7.7 seconds to about 5.5 seconds, and turning the 270hp/278torque at the crank into roughly 350 a piece (hp/torque) with the current tune. After lots of heavy additions to the rig (sliders, skids, winch), a 3.5” lift, a roof rack with lights (wind-sail), and a tire size increase to 285’s this is a must have. The addition of the supercharger has been an amazing improvement to the vehicle. Times where the engine struggled with gear-searching and slow response have gone away, and she actually throws me back a little when I mash on the accelerator. It does not matter which one you choose, so long as it is baffled and sealed. An oil catch can gathers aerosolized oil from the positive crankcase ventilation valve (PCV valve). The combustion in your engine causes blow-by, which is essentially gaseous elements of engine combustion that sneak past the piston and the cylinder wall into the crankcase. This concoction has to be released to alleviate pressure through a PCV valve, but because of agitation and heat, oil also aerosolizes in the blow-by before it can escape through the PCV valve. An oil catch can removes this oil before the blow-by is dumped back into the intake portion of the engine. This will prevent oil from bathing the intake and combustion chambers. In supercharged vehicles oil catch cans are even more helpful, as higher pressures from the supercharger cause more blow-by. I Selected the Icon Stage 2 tubular UCAs (Upper Control Arms) because of the legendary reliability and great on-road and off-road performance for which Icon Vehicle Dynamics is known. This gave me 3.5” of lift in the front, 2” in the back, and leveled the vehicle with the front coilovers dialed up. The Stage 2 best suited my needs for several reasons: First, the Stage 1 keeps the factory upper control arms and therefore does not allow you the option for extended travel suspension. The Icon stage 2 suspension comes with either tubular UCA’s or (more expensive) billet aluminum upper control arms. While the billets are heavy duty and very impressive to look at, the tubular UCA’s knock $700 off of the price tag and still get the job done. I think I would be more inclined to get the billets if/when I get a front bumper that has a steeper approach angle, you can see the upper control arm more in that circumstance, which may justify the cost for the look. Also if I were really pounding the suspension every weekend I would do it for the sake of strength. The higher stage Icon Suspension Kits begin to incorporate lower billet trailing arms and separate cooling reservoirs. The trailing arms I was equivocal on and, in the absence of any high speed runs through the desert, thought the reservoirs to be a little overkill for the money. Thus far I have not been disappointed with Icon stage 2 suspension system. I have had it for a year now, and other than some initially stiff handling (normal until things settle) which eventually loosened up, have not noticed any change on the road (it is not stiff, nor does it make the vehicle more truck-like), and have been phenomenally impressed off the road. The NV wheels have a nice, blackout look and have backspacing the fit most lift kits. The beadlock is simulated, so if you really care about locking the bead of the tire to the wheel for low air-downs, it may not be the wheel for you. The bolts (simulated beadlock) are zinc, which can corrode slightly in harsh climates, but don’t rust. Personally, I love them. I can air down a bit for some moderate off-roading or rock crawling and have not had problems. Plus the price and availability is very nice. I chose these tires because everyone eventually migrates to this size with some slight fender modifications or wishes they did. They fit great on my rig, though every rig is different and I did modify the fenders and wheel wells to accommodate (this took maybe 15 minutes and now sawing/drilling). The KO2’s are WONDERFUL. They last forever, do not drone on the highway, look aggressive, get the job done on the trails, and have been a reliable tire for me for a long time (even on my old rig). The durability when rock crawling has been impressive and is likely secondary to 3-ply construction with durable sidewalls. This was an awesome upgrade. 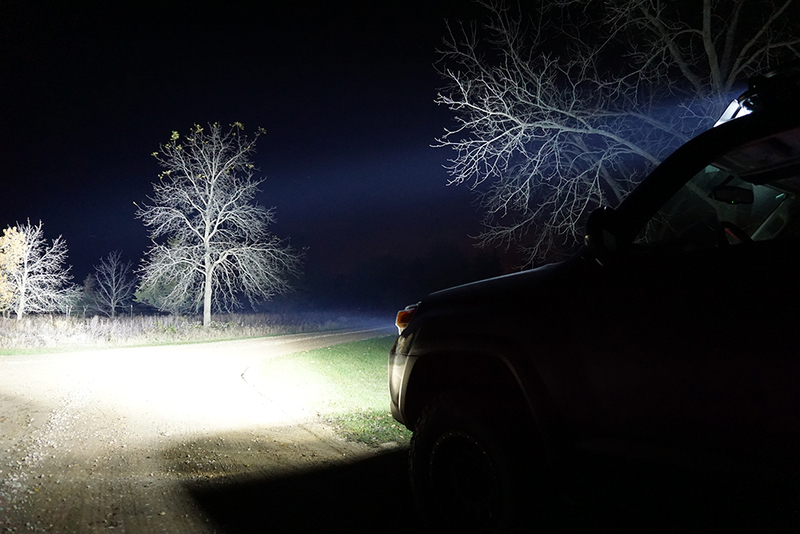 The SR20” is super bright and rigid makes LED built to outlast the vehicle. The upper grille insert looks aggressive and the light casting 7500 lumens of combination spot and flood light is nice on the trail. The J40 emblem is classic, and makes the vehicle look more like the traditional Toyota off-road vehicle and less like a Rav4. What can I say? I love the Rigids. These four 6” E-series, also combination spot/flood are 4500 lumens each and literally cast daylight hundreds of yards in front of me on the trail. The brackets took a bit of work to custom grind (or else the lights back into the front of the Gobi rack), but keeping the lights low for clearance was a clutch move. If you look at the 40” comparable E-series light bar you will see it has about 20500 lumens, and the four 6” only total 18000. I was willing to sacrifice the light for the classic four light look, particularly with the grille mod adding so much. Now, this was a great find! For those of us that don’t have the time to wire a bunch of relays and are tired of wire-clutter in our trucks, here is a great solution. Shrockworks will pre-wire a Bussman with 5 constant draw circuits and 5 relays, all fused, and has built a custom no-drill bracket (the most space efficient out there) for it to sit on. This saves a ton of time, allows you a ton of accessories, and reduces the clutter of several different lines going to the positive battery terminal. The only issue is the “extra” wire that you are left with if you don’t have ten accessories to add immediately. I ran this in a loom along the firewall and pull wires out as I need them. Colored lights under the truck are not for everyone, but I installed these because I thought they were fun. The use BLE dim programming via Bluetooth and are RGB LEDs, giving off really nice red, green, and blue lights. White is not true white, however, it’s a blend of colors. You can’t beat the price, however, being less than a third of some upper end “rock lights” and if you mount the power module in a dry spot under the hood they apparently last for a long time. Nice kit that can turn on, off, or on-in-reverse. They cast 1500 lumens each with a diffuse pattern. Good for backing up in dark places or camping with the family. These disk shaped lights can be mounted under the hood to allow for illumination while working on things in the engine compartment. 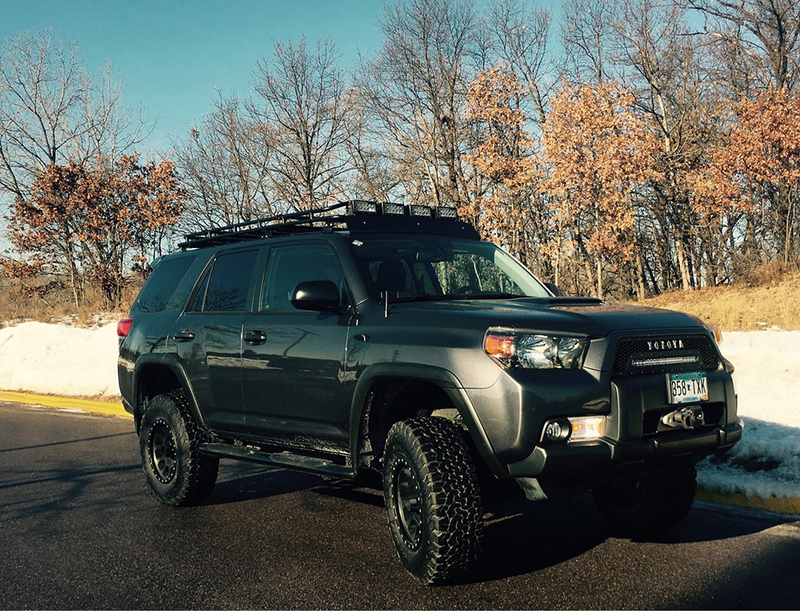 The Gobi roof rack is iconic in the world of 4runners. It is well constructed, has a great static load capacity (800lbs) for things like roof top tents and great dynamic capacity (300lbs) for hauling gear. The look, combined with no-drill installation and ability to add things like lights, awnings, hi-lift jacks, and gear make it, in my mind, the gold standard. This plate is aluminum, which was honestly a big consideration for my Minnesota-based rig. Aluminum can be more “sticky” than steel, so for the true rock crawlers out there it might be better to go that route. For me, protection and avoidance of rust was key. Bud makes an awesome hidden winch mount at the right price point. Honestly, many of these are similar, fitting onto the front end of the chassis under the front bumper support. The construction of this piece, however, requires only the removal of the lower valence grille mesh, rather than cutting up the bumper, which I like. In short, the cheapest reliable wireless waterproof winch on the market. Although some corrosion with the wireless switch on the winch (a not uncommon problem, I am beginning to find out) may make it the cheapest waterproof winch on the market. I chose the synthetic rope to save on weight. Rather than have a heavy steel hook dangling from a tow-point on the front end I opted for a sleeker, lighter, well constructed Factor 55 product and am not disappointed. It lies flat on the vehicle, has been resilient during winch use, and has given me zero problems. So I used to have Westin Nerf Bars because they are black, they were easy for my kids to climb in an out of the car on, and they didn’t corrode. Unfortunately, one good run in the Appleton, MN Offroad Park put those to an end after I kissed a tree. I decided to go with Shrockworks because, in addition to their traditional rock sliders, they make a leveler dimpled treadplate model that still allows passengers (little kids) access with a step that is perpendicular to the vehicle (rather than beveled up). I spoke with Shrockworks beforehand and they recommended the traditional powered coat rather than the textured in order to prevent corrosion. 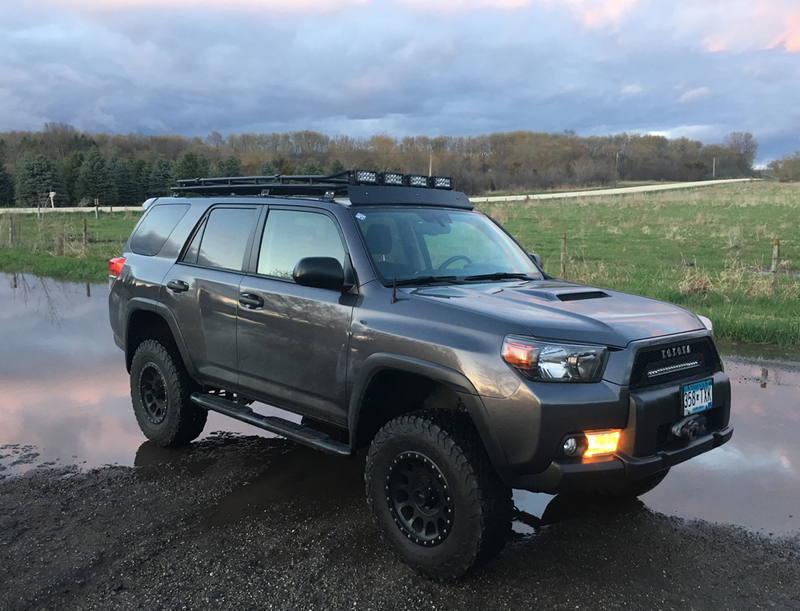 I can honestly say, these things are rock solid and have held up for over a year against bashing rocks and trees, as well as the salty MN roads. The kids still get in and out easy, the only thing I might do is add some truck bed liner to the tread plate because it can get a little slick when its wet. 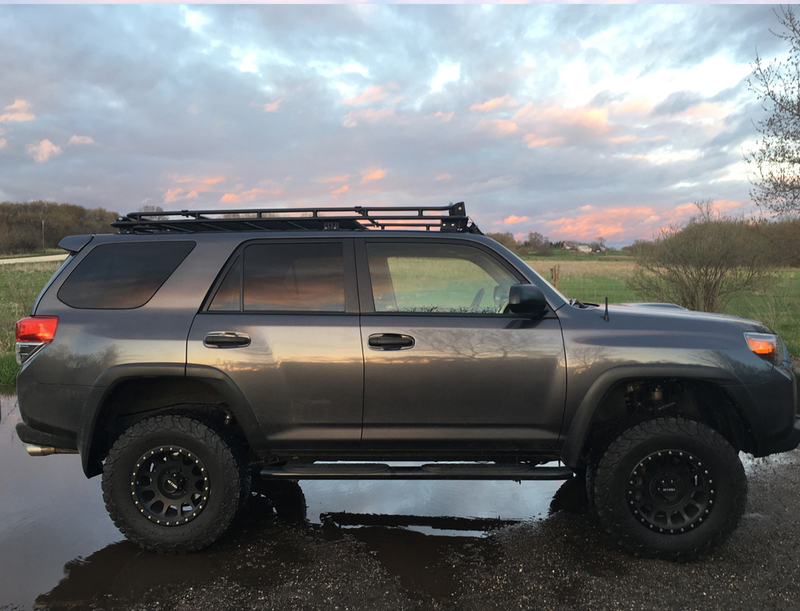 I selected the Borla because it seemed more aggressive sounding than stock but not as drone-prone as the 5th Gen 4Runner Magnaflow. I was looking for “the gentleman’s cat-back” and got it. It gave the vehicle a throatier startup, earned me back 0.5mpg’s, and made a small but notable difference in power. By cutting and repurposing the brackets and wiring harnesses I was able to install these and they barely fit. They have made, by far, the biggest difference of any audio upgrade I have put on/in the vehicle. These speakers required some trimming and customization of the bracket required to install them (Scoshe SAT6 bracket). They have an RMS rating of 4-60watts and sound great in the rear doors and hatch. My goal was to dramatically reduce the road noise and essentially cancel any slight droning from the exhaust. This was successful. The reduction of noise from outside the cab in combination with the increase in sound quality certainly made the ride feel more luxurious. Interestingly, the limited 4Runners have a hood liner that is fixed to the underside of the hood with tabs. Many Trails and SR5’s do not have this. The purpose is to insulate engine noise. I put dynamat under the hood (because if a little is good, way too much is better) and placed this hood liner on top to cover it. It looks stock and significantly reduced engine noise. I mounted the KC lights to this and hid the wiring under the insulation.